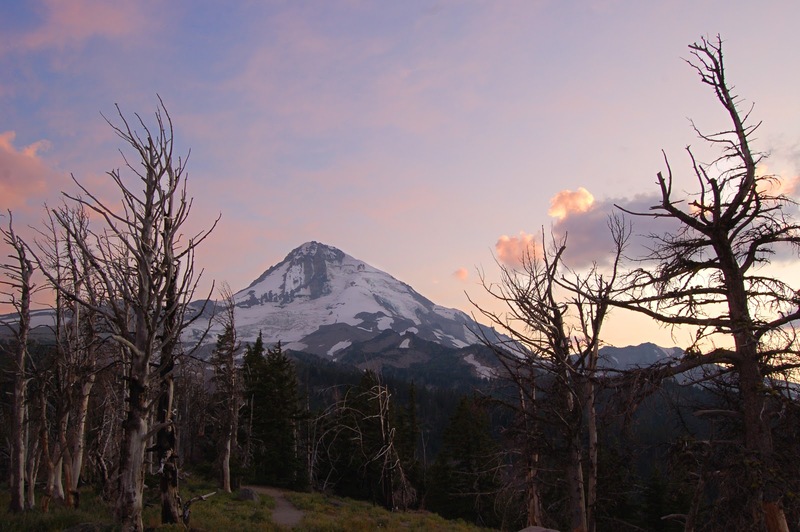 I snapped this photo at dusk up at Cloud Cap Inn on the east side of Mt Hood. The trees are all barren from many years of wildfire that threatens the area. Last year there was a very bad fire that got pretty close to this area. Luckily, it was spared. The dusky pinks really make a lovely background for the mountain. I love seeing the snow on the peak. As a former resident of Oregon, I've appreciated the beauty of Mt. Hood myself. What a gorgeous photo! Having lived for a number of years in Oregon, Mt. Hood is always one of my favorite places!! Lovely capture and gorgeous skies! Sad about the wild fires, we've surely had our share in Eastern Washington this year! Have a great weekend! Isn't that one amazing view! I love the delicate colour of the sky!! That's lovely and the soft pastels create a sense of calm. I am so glad it was spared and shared. :-) I shared it on pinterest. Quite a striking and unusual composition, yet still beautiful.